Imagine a sire who is heterozygous (one A variant and one B variant) for a DNA position. At that same position a dam is also heterozygous. If we consider two progeny of this pair of sire and dam, they can be 0% related to 100% related at this position. If we apply this to the entire genome, we expect full siblings to share 50% of their DNA. But, just as the relationships can vary at a single locus, the relationships can vary for the entire genome. In chicken data, researchers see that the relationship between siblings ranges from 0.2 to 0.7. By more precisely measuring the relationship between animals, genomics allows us to more precisely predict an animal's genetic merit. Genomics allows us to improve several parts of the key equation for genetic change. Genomics allows us to have more accurate selection decisions, increase the selection intensity and decrease the generation interval. Genomic predictions have previously been shown to be accurate for Simmental cattle (Saatchi et al. 2012). 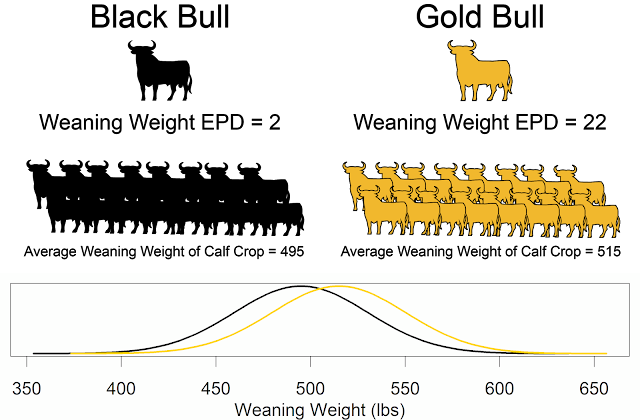 Genomic predictions are reliably predicting yearling weight. 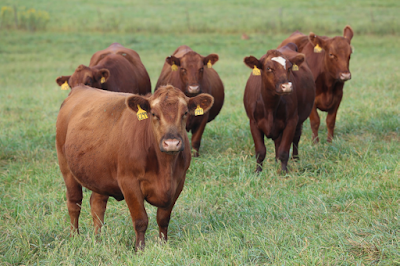 Genomic predictions are explaining real differences in yearling weight. Based only on the genomic prediction (molecular breeding value), there is a 100 pound difference between animals in the top 25% and bottom 25% of animals based on the genomic prediction. Genomic information can be used for more than just producing genomic-enhanced EPDs. Saatchi points out that strings of DNA variants (called haplotypes) are sometimes never observed in two copies in an animal. If these haplotypes are never seen it two copies it likely means that they carry a variant that is responsible for the loss of pregnancies.